View of Matlock Bath, a village in Dovedale in Derbyshire.This is a narrow, gorge like valley about 3 miles long. It is unusually compact, which adds to its charm. As can be seen in the print it has steep wooded slopes. The limestone cliffs on either side of the river, form interesting architectural shapes. 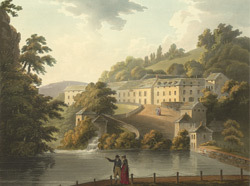 John Byng, Viscount Torrington visited here in 1789 and enthused 'The passage of this vale is truly romantic; on either side, banks and woods, varying at every turn; with the charming River Dove rippling to our left'.